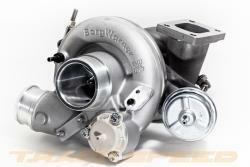 4-port boost control valves are designed to control dual-port external or internal wastegates. They provide more accurate boost control and wider available boost ranges than 3-port valves. This kit is designed to bolt up in place of the standard valve included with every Borg Warner EFR turbocharger. Use this kit in conjunction with our Turbosmart Dual-Port EFR Actuator for the best available boost control for your Trackspeed EFR system.